What is CryptoWall | How to Remove CryptoWall Ransomware? CryptoWall belongs to the ransomware family that uses advanced techniques to infiltrate computers and hides from its victims. Simply put, the Cryptowall is a Trojan horse that encrypts files on the jeopardized computer and then proceeds to threaten the user to pay a ransom to have the files decrypted. The ransomware arrives on the affected computer through spam emails. Basically, by making use of the exploit kits hosted through malicious ads or compromised sites, or other malware. It is important to have a virus protection program in place to stay protected. The CryptoWall ransom was first found in the wild around 2014 – it was very popular then! Ever since then, online fraudsters with the help of illegal programmers and developers have updated and iterated on it several times. This has made it, even more, harder to detect and remove. When a computer is infected, it is important to update the antivirus software on the computer or network to stay safe. CryptoWall virus is easy to use and cheap. It spreads quickly and victimizes people who end up paying the ransom expecting to get their files back. It’s necessary to constantly keep an eye on vigilance to protect data from the CryptoWall virus and all its variants. Have the best antivirus installed on your system, this approach will help steer clear from all types of cyber attacks. It is believed that CryptoWall Locker virus was developed by the same team of online criminals who might be accused of developing Cryptolocker, CryptoDefense, BitCrypt, Cryptorbit, and Critroni. All the mentioned CryptoWall ransomware arrive through Trojan horse which might use exploit kits and malicious spam emails. The ransomware is powerful enough to infect all Windows versions, including Windows XP, Windows Vista, Windows 7, and Windows 10. Once the system is infected, it runs new registry entries with Windows startup. From then on, it connects to distant locations and starts interacting with the Command and Control server. After infecting the system, the ransomware encrypts predetermined files and blocks the user so that they don’t access them. It is not advisable to pay the money that the online fraudsters demand as there are few guarantees that the user will retrieve the files. Remember, it is just a cunning and crooked way to earn illegal money. 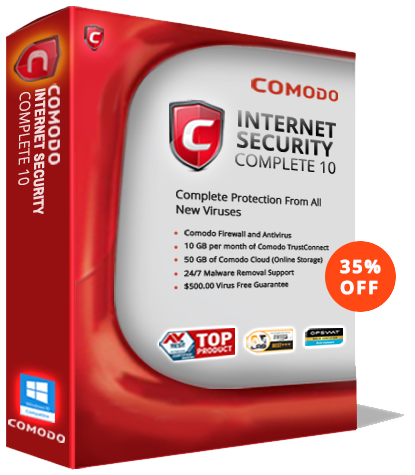 Run a full system scan Comodo free antivirus after the attack to stay rest assured that the CryptoWall is out of your computer completely. Antivirus Software which provides effective and reactive features and methods to help terminate both known and unknown threats.